3 moves that you coach will teach you and each D-linemen will have his favorites. However, there are a few rules that will help you. First, the elbow is the weakest joint on the arm. Always try to work the elbow of your opponent when executing the release move. Second, be violent when you execute your release move. Third, two hands are stronger than one. Work against one of his arms with two of yours. Finally, one arm is longer than two. This means than if you extend with one arm and bring your other shoulder back, the blocker will not be able to grab you and it will be easier to slide off. Tackling on the Line of Scrimmage The tackles the D-Linemen are asked to make are among the most difficult in football. You must properly engage a blocker, find the ball carrier, release and get in a position to make a tackle. All this happens extremely fast and must be executed against a very good athlete (most running backs are) who has already gained a lot of momentum. However, you have two things in your favor. First, you are probably bigger. Second, there is very little room for ball carriers to maneuver on the line of scrimmage. If you use good technique, there is no reason to not be a consistent tackler. When the ball carrier commits, you must fully release from the blocker and get very low. Aim for his legs, wrap him up and drive with your feet. The problem that many D-lineman have is that they release and do not have enough time to break down properly. This often results in failed arm tackles or too many yards after contact. A simple tip can help. As you execute your release move, drop the knee of your back leg to the ground. (e.g. if you are releasing to the left, drop you right knee) make sure that you are leaning forward as you do this to make sure you don t get pushed over. Once you are down, simply lunge into the hole, get you head across the ball carriers body and wrap. I ve personally seen great tackles made this way. The worst case scenario is that you fall down, clog up the hole and force the ball carrier to bounce. This is still a good result. Defeating Specific Run Blocks BLOCK DIAGRAM DESCRIPTION Base Primary Key blocks you straight on. 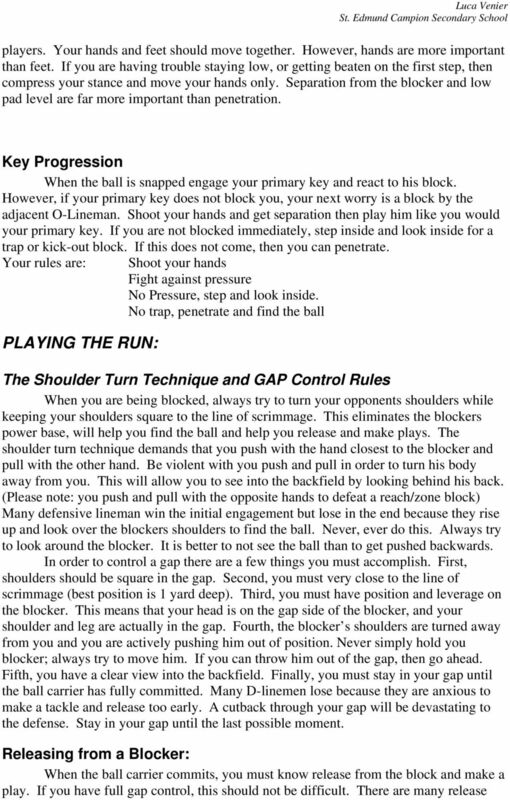 Engage him, fight against pressure and get gap control Reach/Zone One of the most difficult blocks to recognize and can come from either lineman in front of you. The blocker tries to take away your gap position by getting to a head up position or across you body. Move with him and keep your head in the gap. Push his near shoulder and pull with the other hand. This is the opposite to your actions versus a base block. It will prevent him from turning you. Fight to keep your shoulder and leg in the gap. 4 Down/Fan A block from the adjacent lineman. It all depend on when you recognize it. If you see it early, play it like a base block. If you see it late and the blocker gets position, lean into him and shiver him with your forearm to protect yourself. Then work your arms inside and try to get gap control back. Double/Chip Both lineman block you. Your job in this case is to hold your ground and not allow the reach block by one o-lineman and the release by the other. Your primary key will come at you. Therefore, you will naturally play it like a base block. Then, while holding on to your primary key, try to get low and sideways in the hole. Push your hip into the other blocker and fight to hold your ground. If you get blown back, fall down. 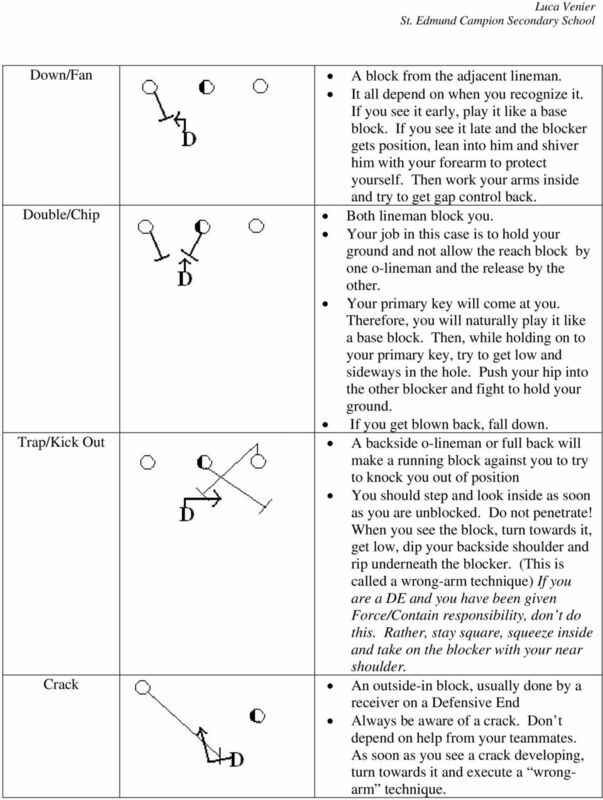 Trap/Kick Out A backside o-lineman or full back will make a running block against you to try to knock you out of position You should step and look inside as soon as you are unblocked. Do not penetrate! When you see the block, turn towards it, get low, dip your backside shoulder and rip underneath the blocker. (This is called a wrong-arm technique) If you are a DE and you have been given Force/Contain responsibility, don t do this. Rather, stay square, squeeze inside and take on the blocker with your near shoulder. Crack An outside-in block, usually done by a receiver on a Defensive End Always be aware of a crack. Don t depend on help from your teammates. As soon as you see a crack developing, turn towards it and execute a wrongarm technique. 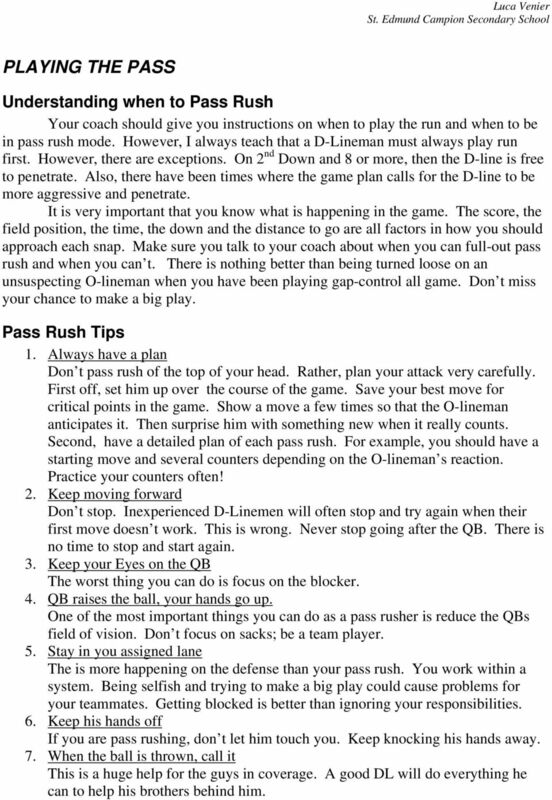 5 PLAYING THE PASS Understanding when to Pass Rush Your coach should give you instructions on when to play the run and when to be in pass rush mode. However, I always teach that a D-Lineman must always play run first. However, there are exceptions. On 2 nd Down and 8 or more, then the D-line is free to penetrate. 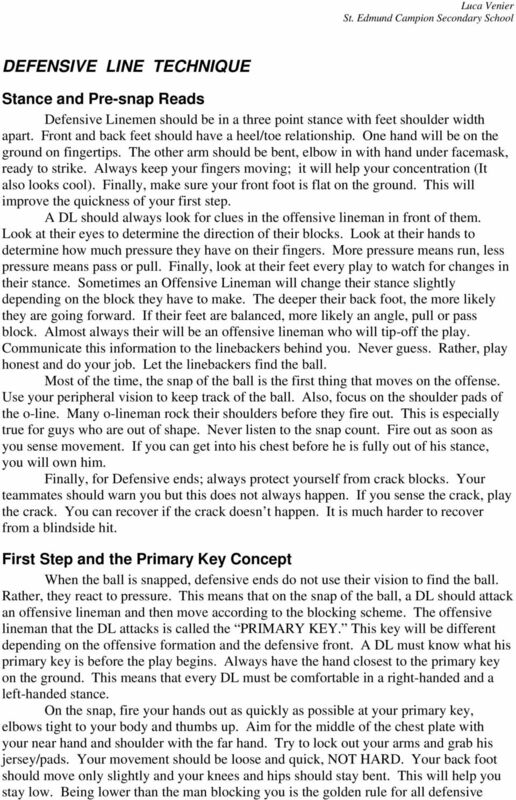 Also, there have been times where the game plan calls for the D-line to be more aggressive and penetrate. It is very important that you know what is happening in the game. The score, the field position, the time, the down and the distance to go are all factors in how you should approach each snap. Make sure you talk to your coach about when you can full-out pass rush and when you can t. There is nothing better than being turned loose on an unsuspecting O-lineman when you have been playing gap-control all game. Don t miss your chance to make a big play. Pass Rush Tips 1. Always have a plan Don t pass rush of the top of your head. Rather, plan your attack very carefully. First off, set him up over the course of the game. Save your best move for critical points in the game. Show a move a few times so that the O-lineman anticipates it. Then surprise him with something new when it really counts. Second, have a detailed plan of each pass rush. 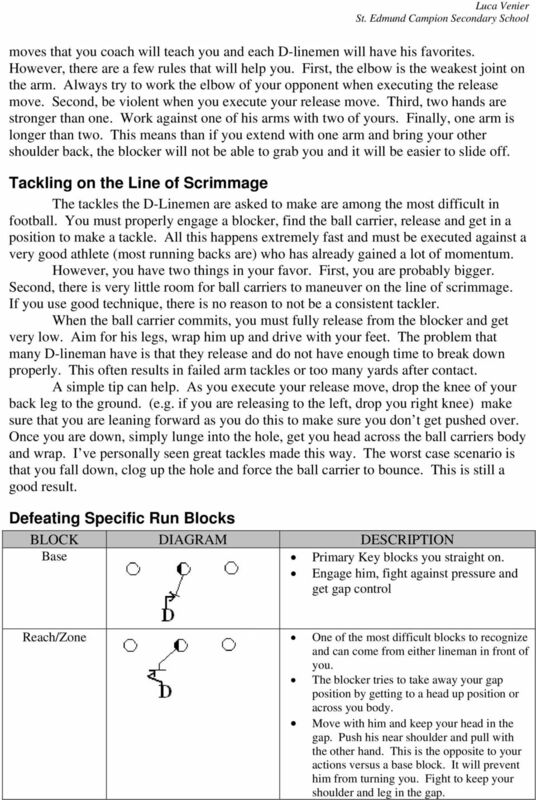 For example, you should have a starting move and several counters depending on the O-lineman s reaction. Practice your counters often! 2. Keep moving forward Don t stop. Inexperienced D-Linemen will often stop and try again when their first move doesn t work. This is wrong. Never stop going after the QB. There is no time to stop and start again. 3. Keep your Eyes on the QB The worst thing you can do is focus on the blocker. 4. QB raises the ball, your hands go up. One of the most important things you can do as a pass rusher is reduce the QBs field of vision. Don t focus on sacks; be a team player. 5. Stay in you assigned lane The is more happening on the defense than your pass rush. You work within a system. Being selfish and trying to make a big play could cause problems for your teammates. Getting blocked is better than ignoring your responsibilities. 6. Keep his hands off If you are pass rushing, don t let him touch you. Keep knocking his hands away. 7. When the ball is thrown, call it This is a huge help for the guys in coverage. A good DL will do everything he can to help his brothers behind him. 6 Pass Rush Moves There are so many moves and combinations out there, that I will only cover a few that I have had success with. 1. Tri-pod Bull Rush: You should always have a power move in your arsenal and this is one of my personal favorites. It s called a tri-pod because you hit the blocker with three things at the same time. As you rush forward, your hands should strike the blocker on his armpits while your forehead smashes into his chin. Lead with your eyes to ensure that your neck is in a good position and that you are lower than the blocker. After delivering the blow with your hands, grab the blocker at or under his armpits and push at an outwards angle to try to spread his arms apart. If done well, this technique will reduce his ability to push back with his arms. At this point you will continue to drive him back until you have reached the depth of the quarterback or the blocker has set his feet. At this point, hit him with a quick rip or swim move to release. Just remember that this move must be performed in the most violent way possible. 2. The Long Arm/Darth Vader This move relies on the principal that one arm is longer than two. As you approach the blocker, turn your shoulders and strike him with one hand in the middle of his chest. Immediately allow your arm to slide up until your hand is around his throat. Grab him and push! If you do it right, he will be unable to get a good hold on you and will instinctually swat your hand away. As soon as he hits you, swim/rip past the arm he swatted with. This whole process usually happens very fast, so be ready. Even if it doesn t work as planned, this move is great for getting separation and inside position. Also, in all the years I have coached, I have never seen anyone get a penalty executing this move. 3. 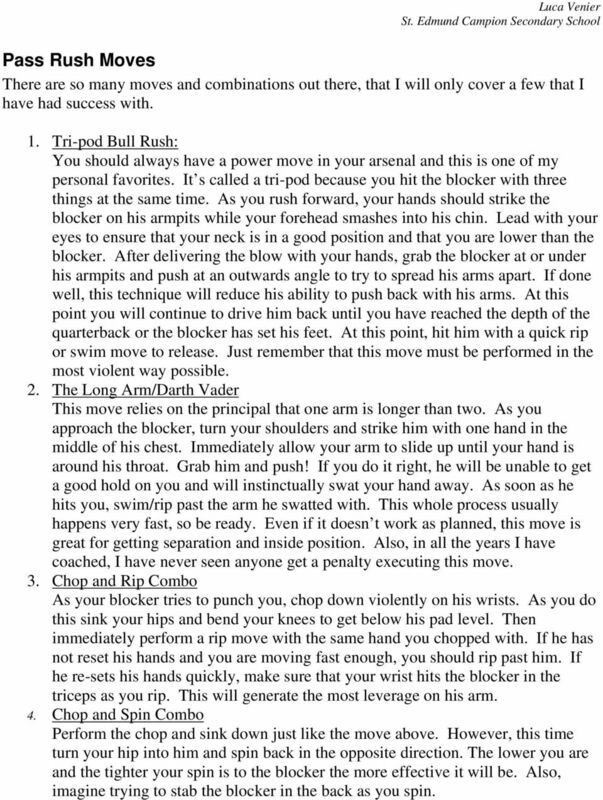 Chop and Rip Combo As your blocker tries to punch you, chop down violently on his wrists. As you do this sink your hips and bend your knees to get below his pad level. Then immediately perform a rip move with the same hand you chopped with. If he has not reset his hands and you are moving fast enough, you should rip past him. If he re-sets his hands quickly, make sure that your wrist hits the blocker in the triceps as you rip. This will generate the most leverage on his arm. 4. Chop and Spin Combo Perform the chop and sink down just like the move above. However, this time turn your hip into him and spin back in the opposite direction. The lower you are and the tighter your spin is to the blocker the more effective it will be. Also, imagine trying to stab the blocker in the back as you spin.